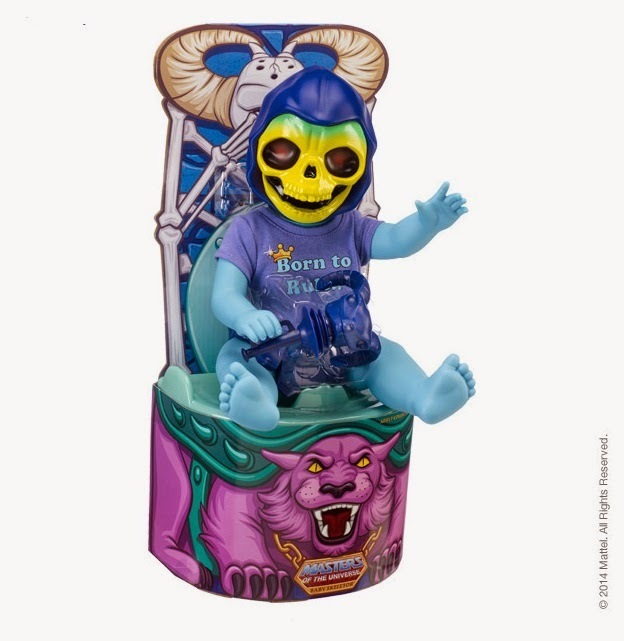 MattyCollector has announced they will be releasing a Baby Skeletor figure. The figure will measure 12” tall with articulation in the legs, shoulders, and neck. The figure comes with a removable T-shirt that says “Born to Rule” and a rattle version of his Havoc staff. The box he comes in will look like an Eternian bathroom and Baby Skeletor comes with a tiny toilet for him to sit on. The figure will be in line with Matty Collector’s prices, so he will run you 35 dollars if you need to own this tiny terror. So you may be asking yourself why this exists. It’s a pretty valid question actually. The figure is based off a Robot Chicken sketch where Skeletor turns himself into a baby to sneak into King Randor’s castle. It’s Robot Chicken so Skeletor ends up with a spanking fetish at the end of it. Anyway it’s not the first Masters of the Universe figure to be produced because of Robot Chicken, but it may end up being the strangest.